A Great Time was had by All at 5th Annual Edcamp Cape Cod @ SHS/STEM Academy! Posted on August 20, 2017 by Sandwich Learns Together/ SPS in Celebrate SPS!, Did you know? On Monday, August 7, 2017, the Edcamp Cape Cod team hosted its 5th annual edcamp at Sandwich High School and STEM Academy! Over 125 educators and administrators from 28 school districts across Massachusetts and beyond gathered at SHS for EdCamp Cape Cod 5. EdCamp is a gathering of those who want to learn and want to share their learning. It is often called an “unconference” to distinguish it from teacher Professional Development that is pre-organized around a particular topic or set of workshops. 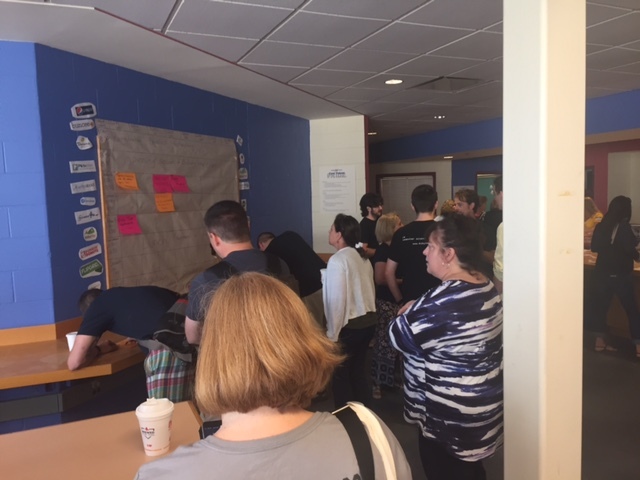 At EdCamp, participants arrive with questions they are hoping that others in the group can help them to answer and instructional strategies that they are passionate about sharing. EdCamp is free to participants, and supported by sponsors who donate breakfast, lunch and door prizes. EdCamp models a style of PD where the participants set the agenda and sessions for the day. EdCamp also helps teachers to experience open sharing of ideas. Both twitter and google docs were used for collaboration throughout the day. 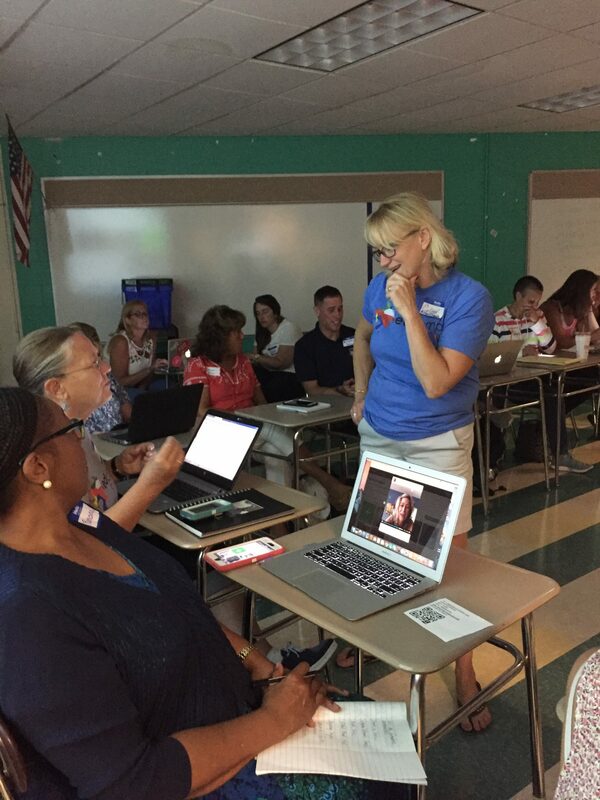 Teachers arrived at the Fifth Annual EdCamp Cape Cod to find an open-ended schedule. The schedule is created by the participants as they arrive.The slots quickly filled up with topics that some educators wanted to discuss and learn about and with information that others wanted to share. Problems and questions can be posed, or experiences can be shared. There is less a focus on an ‘expert’ and more of a shared common purpose/experience. Edcamp Cape Cod would not be possible without the help of many. The administration and our school committee have supported this event for the past 5 years and we are very grateful for this support. This event also makes extra work for our custodial staff, who understand the importance of the event and bend over backwards to accommodate the team. Our student volunteers are a big part of the event as well. Not only do they help participants find their way around the building, answer questions, but they also run sessions every year to help teachers understand student perspective in the learning environment. Twitter was busy with the use of the #edcampcapecod hashtag! 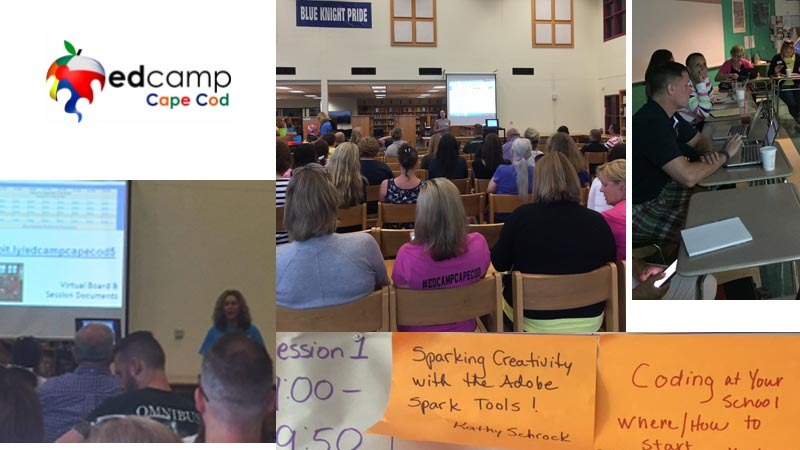 Check out the postings that further shared the great learning that took place at EdCampCapeCod 5 http://edcampcc5.weebly.com/ . Our day wrapped up with sharing and reflection of what was learned. Also several prizes from edtech companies were raffled! It was a great way to wrap up a truly amazing day.